BIG weekend, this last. 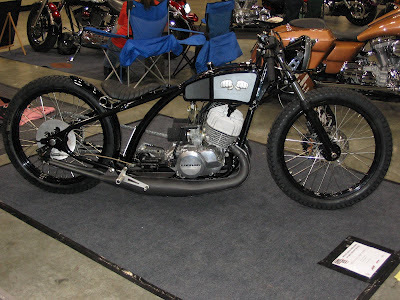 The 25th Annual Donnie Smith Bike Show in St. Paul was another success, both in terms of the quality of the show and the number of attendees. Normally this is a four day event for me, due to the fact that the promoter is an old friend so I donate Thursday and Friday toward helping with show set up (and he in turn takes care of me with a complimentary vendor space). This year was slightly different, in that I preached at Friendship Manor on Thursday as part of the service put on by Valley View Baptist, leaving me with only a three day investment in the show. 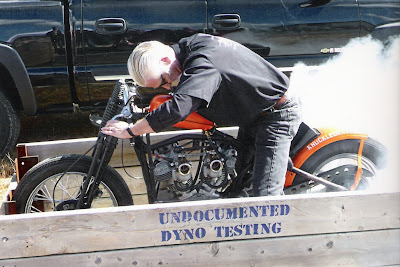 With the advent of the NVMDRA, I had another motivation added to promoting my business; promoting vintage motorcycle drags. As such, it was a natural for me to put the Knuckledragger on display in my booth, as seen below. 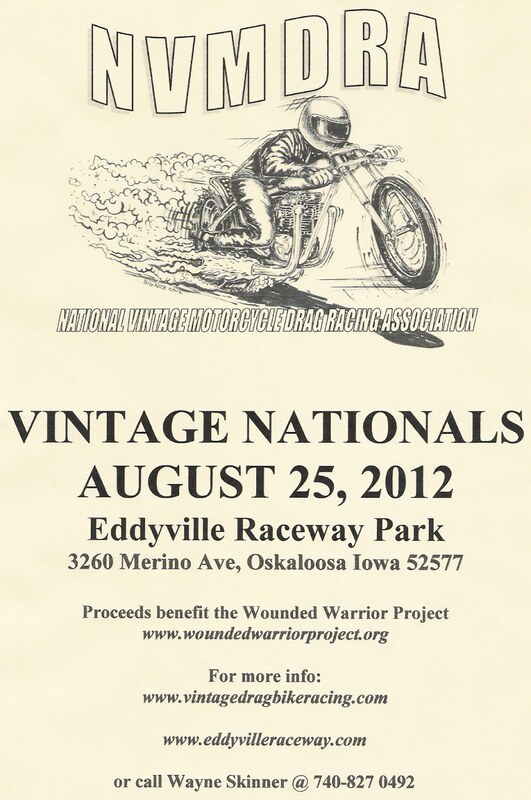 This year's biggest event for vintage motorcycle drag racing is shaping up to be the one in Eddyville Iowa in late August. 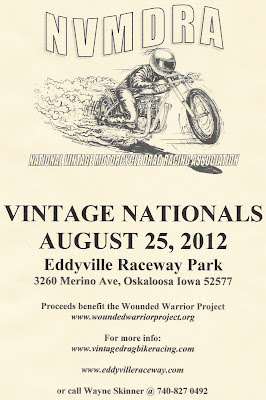 Below is the flier that I handed out this past weekend. 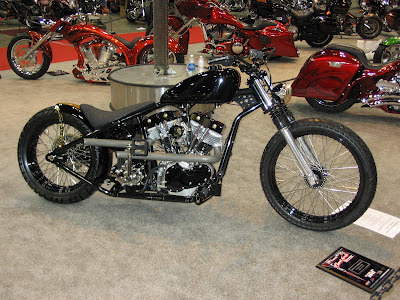 Fitting hand in hand with that, was this beautiful Iron Head Sportster drag bike that was on display in the show this year. 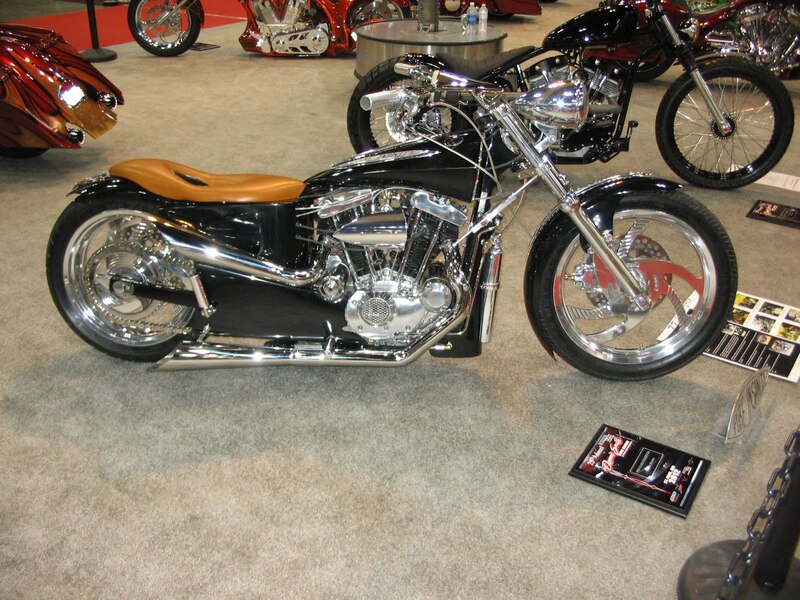 According to the owner, you can expect to see it at the Eddyville race this summer. 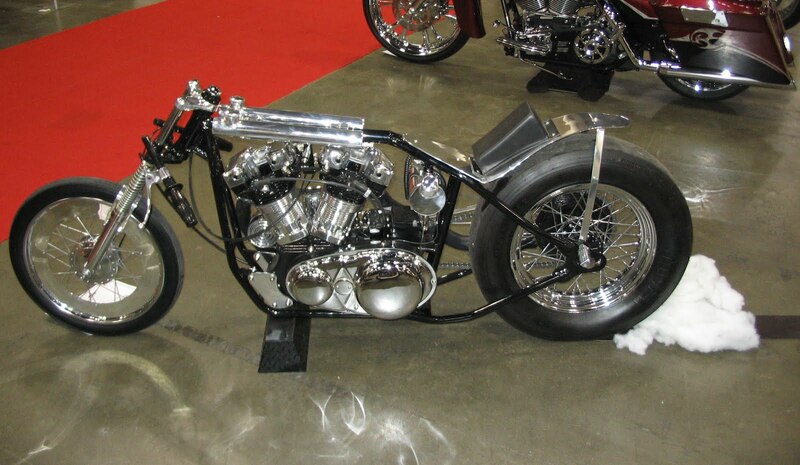 As seen below, this bike is show quality, sort of the antithesis of the Knuckledragger. The pictures above and below are of another XL that caught my eye. A close look at the tank (shown below) confirms that the owner was thinking outside the box. The artwork on the tank of the triple shown below suggest that its name may be "Bare Knuckles". Catchy, and cute, but its no "Knuckledragger". 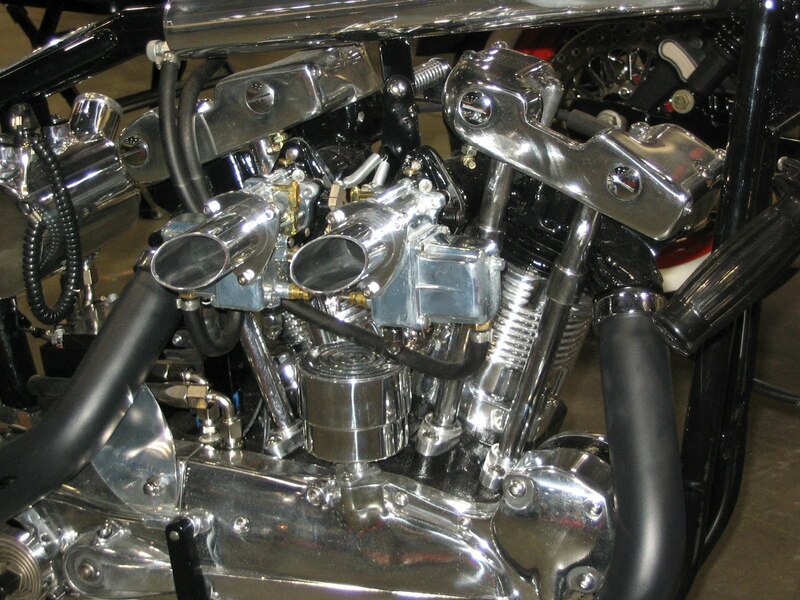 Shovelheads were represented in greater numbers than at any show in recent memory. The beginning of a trend, no doubt. The one shown below is but one of many quality examples. 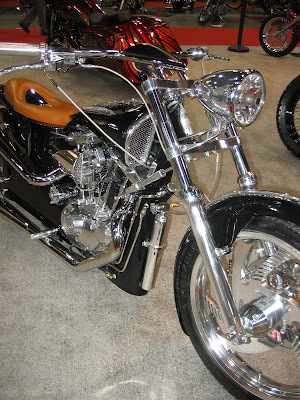 Of course there were an untold number of other show bikes of all styles. Something for everyone, to be sure. The only real disappointment of the show, from my perspective, was self inflicted. 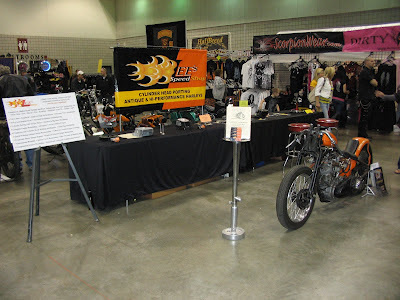 A number of years ago, I suggested and smoothed the way (with the promoter) for one of the Christian motorcycle clubs to hold a church service for the vendors on Sunday morning before the show opened to the public. We have held one every year since. For some reason, this year I assumed that it was on auto pilot, and would take place without my bringing the subject up. My mistake. I should have talked to the guys ahead of time and had an announcement made, but by the time I realized it was not happening it was too late. Not such a big thing, you might think, and I would have agreed, that is until later in the day. That's when a friend mentioned to my wife that she was disappointed because **** (name changed to protect the guilty) only goes to church two times a year ....and this was one of them. Somehow I think anything that reduces the number of sermons a person hears in a year by 50% is a big deal. While these last three verses of the second Psalm are fairly straight forward and easy to understand, they contain some thoughts that are quite interesting. First of all, kings and judges are instructed to serve the LORD. And of course this speaks not of just any lord, but here "LORD" is translated from the Hebrew name Jehovah, which means self existent and eternal. While this command is certainly agreeable to any Christian, for anyone else it is by nature repulsive, and how much more so for those in authority? Kings and judges (that is, those in authority) are accustomed to their word being supreme. Others generally serve them. Obviously monarchs from non-Christian nations will reject this command out of hand, just as they reject the living God who authored it. However, it would be no easier for the "christian-in-name-only" leader to truly bow to this greater power. After all, most of those in authority were either born into it, or worked very hard for their position, both of which tend to give one a sense of entitlement. Even the command to "be wise now" and ""be instructed" are likely to offend them. After all, what book is this that dares infer that they need to be instructed, or that they are not already wise? And if that were not enough, here these kings and judges are told not only to serve Jehovah, but to do it with FEAR! Same issue, but now it seems that Jehovah has doubled down. Those in authority are used to being feared, or at the very least shown respect. It is a real blow to their pride to be told they need to fear someone else. Most kings and judges will never get beyond this point without stumbling. But for those who do, they are told to "rejoice with trembling." Certainly joy and rejoicing is one of the hallmarks of true Christianity, but that joy will always be tempered with fear; at least if one has a proper view of the glory and majesty and holiness of God. Many would prefer to leave this concept in their rear view mirror, along with the rest of the "Old" Testament. They may be willing to give lip service to serving a god who loves everyone unconditionally, but to one who demands fear and trembling? No way! About now you may be wondering what any of this has to do with you and me. After all, this is addressed to kings and judges. The answer, if you've not already guessed it, is simple. There is an old saying that every man is the king of his own castle, and there is some merit in the principle behind that. Each of us does have our own sphere of authority, whether it be in our home or work, or even just in our personal lives. Each of us is called to make judgments for ourselves each and every day on an untold number of issues. In that respect, you might say the command to "Serve the LORD with fear, and rejoice with trembling" applies to us all. If that’s a thought that is foreign to your nature, then it might be time that you put your trust in the LORD: you will be blessed if you do. Just thought I would put up a couple of pics that my friend Watso recently sent me. They were snapped last fall during the annual swap meet in the shop parking lot, hosted by the shop next door. 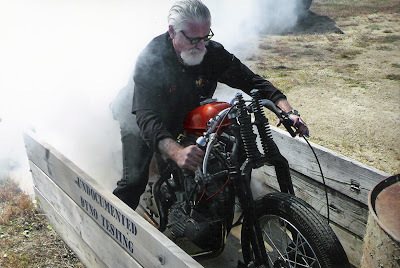 For the last few years we have attempted to have a burn out contest as part of the festivities, with limited success. This year there were only two participants, and both of them were me. One with my son-in-laws Road King and one with the Knuckledragger.